Dom’s grandma put the two silver baht coins in Dom’s small caramel colored hand before he walked out the door. He held them tight as he ambled down the dusty path with huge, yellow-green banana leaves occasionally brushing his skinny legs. Sweat beaded on his brow as he wished yet again that he lived somewhere cold. The smell of fresh Thai herbs filled up his lungs the closer he got to the bustling marketplace. He heard women loudly whacking chicken parts with massive knives as flies buzzed nearby. An old gentleman was tenderly putting mini bananas wrapped in coconut rice and banana leaves on a hot charcoal grill. A fruit vendor was carving the prickly eyes off a fresh pineapple while sticky juice lazily slipped down his strong arm. But Dom only had two bahts. And his grandma had sent him on a mission: to get lemongrass, galangal and kaffir lime leaves. He went to the amiable herb seller who always liked to ask how his grandmas was doing, and took one of the many bundles already perfectly proportioned with each herb and ready to be thrown into tom yum. He handed over his sweaty two bahts, and meandered home, now holding the prized goods in his hand, his tongue already tasting the spicy, sour, soothing soup he would savor in a few hours. How I wish I could just walk down the road, pay seven cents for my fresh Thai herbs and start cooking my tom yum. But instead I have to drive to the other side of town to the Asian market, pick through scraggly lemongrass, find prepackaged galangal, and then drive all over looking for kaffir lime leaves since the Asian market didn’t have them, and finally the produce man at Central Market leads me to a small package of them, and he wonders why I thank him so profusely for his help. Even though buying the ingredients for tom yum can be tricky in America, thankfully the actual tom yum cooking process is much quicker and easier than I would have ever dreamed. Be warned though! Most of what is in tom yum, you don’t eat. It’s just to flavor the soup. 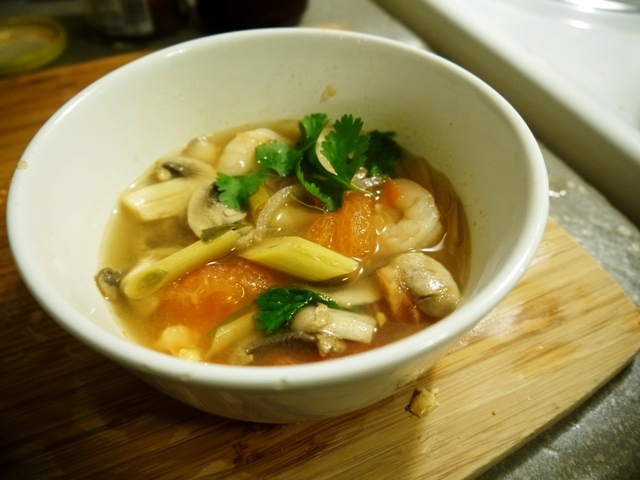 At first I didn’t like tom yum because I didn’t enjoy chomping on woody lemongrass and tough galangal, but eventually I discovered you don’t eat those parts and just scoot them out of the way to get to the broth, shrimp, tomatoes and mushrooms. I got this recipe and revised it a little from a super-legit Thai cookbook Dom got me for Christmas: It Rains Fishes by Kasma Loha-Unchit. Because of her book, lately I’ve been surprising Dom with random Thai trivia (which he already knows) like how Thai farmers hire monkeys to work in their coconut groves to harvest coconuts and holy basil helps a woman’s body heal after childbirth, which Dom forgot to tell me. It’s definitely a good read if you want to learn more about Thai culture and cooking with some authentic recipes thrown in. Tom yum is the Thai version of chicken noodle soup, and makes you feel all better if you have a cold. My snifflely nose is less snifflely with every bite, so if you have a cold, make some now, and if you don’t, I’m sure someone you know has one, so make it for them and invite them over. Let me know what you think in the comments, and if you have any questions, I’m here for you! Need an easy, quick Thai pick-me-up? 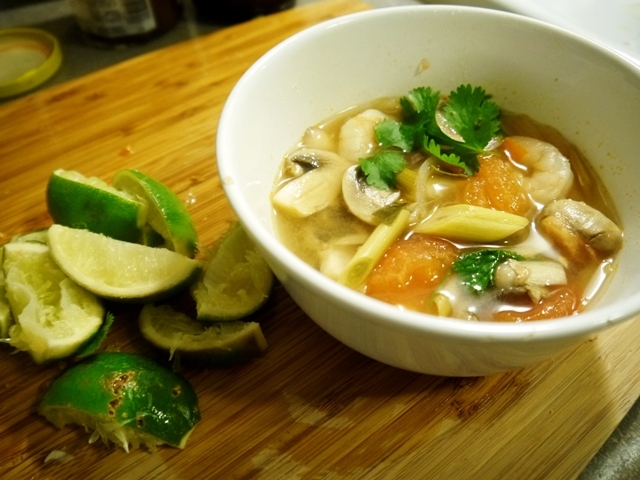 Try Tom Yum Soup! It's simple to make and full of hot, sour, spicy flavors! 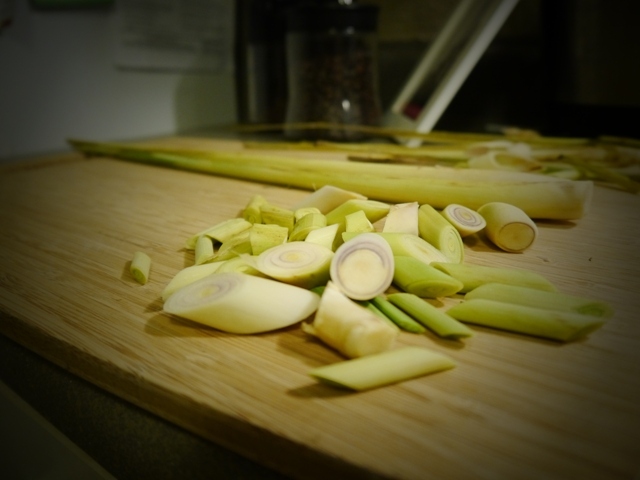 Cut off the bottom tip of the lemon grass stalks, and throw out the loose outer layer. Cut the stalks into 1-inch sections at a diagonal up to the greener end so you can see the inner core. Smash each piece lightly in your mortar and pestle or with the side of a Chef's knife. This lets the fragrant smell seep into your kitchen (a smell that always reminds me of Fruit Loops). Place the cut lemongrass and broth in a soup pot. Bring to a boil. Reduce the heat to low and let it simmer, covered, for 15-20 minutes to let the lemongrass flavors seep into the broth. After it has simmered, add the galanga, kaffir lime leaves, chilies and onion. Simmer for a few more minutes and then add the roasted chili paste, tamarind paste and mushrooms. Heat it all to a boil and then let it simmer a few minutes to get the mushrooms cooked and the flavors mixing. Stir in the sliced tomato and shrimp. ALERT! After 20 or 30 seconds of putting in the shrimp, turn off the heat. If you leave the heat on too long after adding the shrimp, the shrimp will overcook. Eww. Add lime juice to your preference and add the cilantro. If you don't have Thai chilies, you can use jalapenos or serrano peppers. 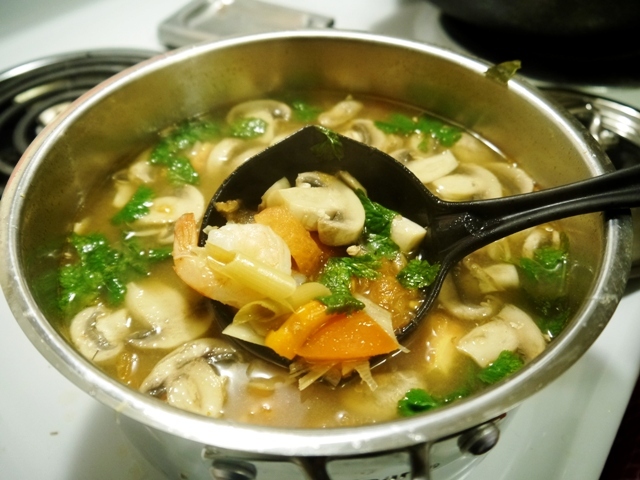 If you are using chicken instead of shrimp, add it to the broth when you add your lemongrass. You can use dried or canned forms of lemongrass, galanga and kaffir lime leaves, but know that it will change the authentic flavor of your soup, but don't worry, it will still be delicious! If you don't have tamarind paste, I would recommend using more lime instead.